$2130 (1985) . . . 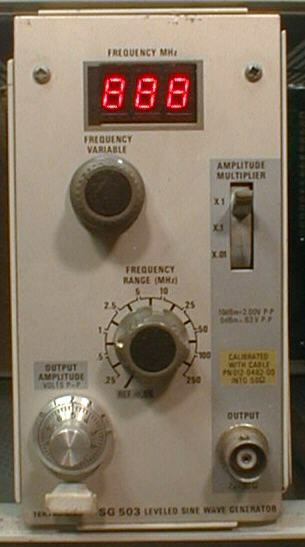 The SG 503 signal generator is a general-purpose leveled sine-wave oscillator. 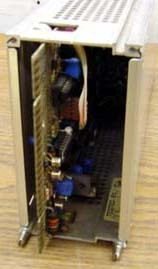 It provides a leveled output amplitude which is variable from 250 kHz to 250 MHz. The selected frequency is indicated by a built-in autoranging frequency counter with a three-digit LED read-out on the front panel. accurately calibrated output voltage into 50 ohms is variable from 5 mV to 5,5 V peak-topeak. Amplitude accuracy 3 %. 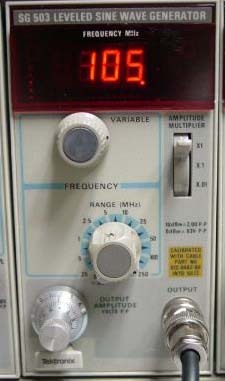 From 250 kHz to 100 MHz output amplitude will not vary more than 1%.